I don't see them doing a full APC (sadly). The cost would probably be close to $200 considering the Blade Fighter vehicle was $100. That being said I could totally see them doing the crew compartment of the APC as a deluxe "environment" like the Predator trophy wall. Do the half that has the monitor set up and the row of chairs next to it. They could even throw Goreman (or bomber jacket Ripley) in as a little bit of extra incentive to buy. I know I'd buy it at least. Yeah the APC might be a bit unrealistic. Would love any kind of dioramas or accessory/creature packs. The USCM arsenal pack was awesome. I picked up the Queen Facehugger and Mantis for Christmas, now I've got my eyes on the Gorilla to complete the wave. It seems like it's the most expensive of the three though which is kinda surprising, I figured that would have been the Mantis. But either way the two I've got look great! I actually like the Queen Facehugger more close-up than I did looking at the pictures, especially the size and colouring. It looks like they did a great job of recreating the red and black of the original. I know it's not the most popular of the Kenner figures but it was one of the few I owned back in the day and I like how unique it is, so it was one I was really glad to see show up in the first wave of remakes. 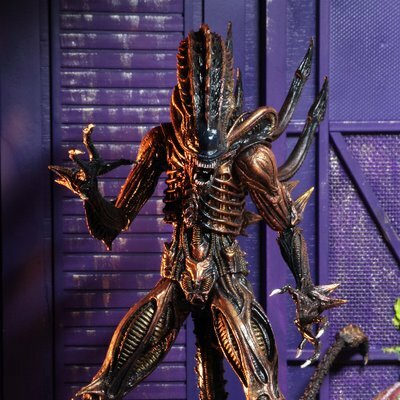 Really liked that Queen Facehugger when I seen it in person, actually scary looking and threatening. Well, technically the brown tint is more accurate. Put a blue light on it! Ill get the Brown I think. I just got wanna know the differences between this ‘Ultimate’ Mold offer the standard one. The blue one has a cooler package. Would have liked if they included the Hadleys Hope sign in this pack. Personally, I can't wait for the chrysalis alien to hit the store. love that game! So tfaw has posted a February 28, 2018 release date for the Aliens – 7″ Scale Action Figures – Ultimate Alien Warrior (1986) Assortment. Beautiful statue but too pricey for me. I like the skinny look. I really like the copper and black colour scheme. That's exactly how I remember the Kenner original looking. And the extra spikiness is a nice way to differentiate him from other figures now that he doesn't explode.